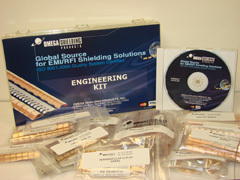 In order to assist application engineers in the determination of appropriate EMI/RFI shielding solutions, Omega Shielding Products offers several sample options. A sample bag (p/n: 099-100-05-20) containing a random product sampling can be requested at no charge. A more inclusive engineering kit (p/n: 099-100-01-20) can be acquired for a minimal fee. Individual product samples are available, in limited quantities, upon request. Shipping and handling charges for all sample requests will apply. Contact our Customer Service department for more information.